November 22 2018, 12:00 p.m.
On a muggy evening in mid-August, a convoy of gold miners and gendarmes in 4x4s and pickup trucks drove on an unpaved road from a Canadian-owned gold mine in Boungou, eastern Burkina Faso. Just a few miles after leaving the facility, the convoy hit a mine. Gunmen jumped out from the thick forest on the side of the road and opened fire, killing five gendarmes and one miner. Two months later, in the northern town of Inata near the Malian border — another gold-mining site — a column of militants on motorcycles ambushed police in the early hours of the morning, killing one gendarme and carrying away police equipment as they fled the scene. The Burkinabé military authorities called in the help of French troops stationed in neighboring Niger, and they sent two Mirage fighter jets that struck the fleeing militants. This opened up yet another front for France’s overstretched military operation in the Sahel region, cementing the perception that six years after the French intervention in Mali, security in the region is deteriorating. Since January 2016, more than 200 militant attacks have killed at least 263 people in Burkina Faso, according to data from Héni Nsaibia, a researcher at the Armed Conflict Location & Event Data Project. The violence “has created a kind of psychosis in terms of security, especially in the north,” said Bénéwendé Sankara, vice president of parliament. “So far, the consequences are terrible. Schools and health clinics are closed, people have fled. It’s become a no-man’s land.” The incidents in Boungou and Inata are emblematic — both in the nature of the attacks and the unknown identity of the attackers — of the destabilization of the Burkinabé state. These attacks are enveloped in a huge mystery — just who is committing them, and why? Gen. Gilbert Diendéré, left, speaks to media in Ouagadougou, Burkina Faso, on Sept. 19, 2015. What’s happening in Burkina Faso appears to be, at least in part, an example of blowback against U.S. anti-terror tactics. That’s because a now-disbanded elite military unit that received training from the U.S. is suspected of being involved in the attacks against the country. There are multiple theories behind the swift breakdown in security — and all turn around the 2014 revolution that overthrew ex-dictator Blaise Compaoré and threatened his feared presidential guard, known by its French acronym RSP and led by Gen. Gilbert Diendéré. By toppling only the president, which led to the disbanding of his key military unit a year later, the revolution left the country with a gaping security hole. As a special unit of roughly 1,300 soldiers with separate living quarters, equipment, training, and pay from the regular army, the presidential guard protected the interests of the party in power, rather than the country at large. The RSP was particularly potent, too — it had its own counterterrorism unit that received training from both France and the U.S. The insecurity that Burkina Faso is experiencing today appears to be proof that support for an elite unit that works for a corrupt dictator can lead to more terrorism and insecurity. This type of mistake is one of the hallmarks of the so-called war on terror and has been repeated, in various forms, in Iraq, Afghanistan, Somalia, Yemen, and numerous other countries. In Cameroon, for example, the Rapid Intervention Brigade, an elite unit that the U.S. has worked with to fight Boko Haram in the north of the country, has been accused of numerous human rights violations while fighting Anglophone separatist groups in western Cameroon. Security forces stand guard on Jan. 16, 2016, after an Al Qaeda attack killed 30 people in a restaurant and hotel in Ouagadougou, Burkina Faso. 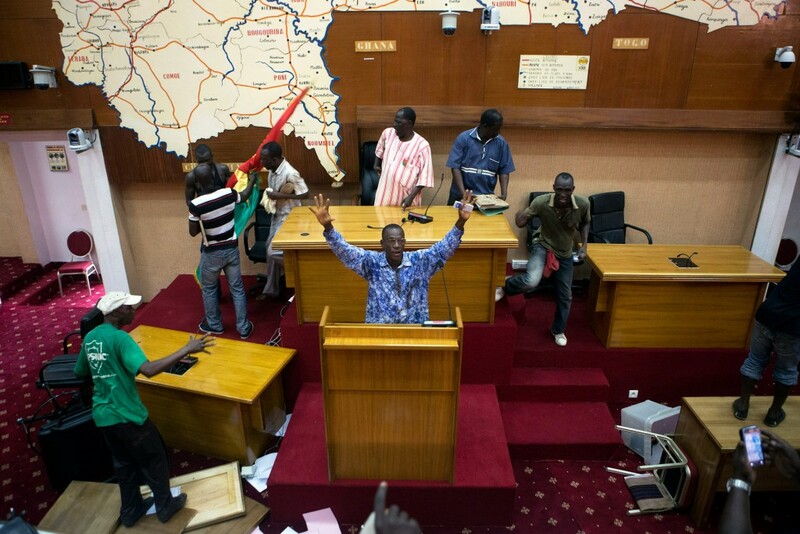 Although the first truly democratically elected government in Burkina Faso’s history took the reins in January 2016, “the existence of the state is still uncertain,” said Méleguem Traoré, a former head of parliament and close confidant of Compaoré, the former president. In March, a double attack hit the army headquarters and French embassy in the heart of the capital, Ouagadougou, killing 16. After gunmen from Al Qaeda in the Islamic Maghreb targeted two restaurants on one of the capital’s busiest streets, businesses have set up airport-style security at establishments throughout the city. In Ouagadougou’s main square, Place de la Nation — where protesters massed to demand the fall of Compaoré in 2014 and again when Diendéré’s men carried out their own coup attempt in 2015 to return to power — jumpy soldiers now monitor all passersby. Strangely, the key to ending the mysterious terror attacks may not lie in remote battlefields, but in a public spectacle that takes place every weekday in the north of Ouagadougou. A garbage collector rides his donkey-led carriage on a street closed for the trial against former Gen. Gilbert Diendéré and the coup plotters of 2015 in the Ouaga 2000 neighborhood of Ouagadougou, Burkina Faso, on Aug. 28, 2018. It happens at 10 a.m. in the upscale Ouaga 2000 neighborhood — traffic is shut down on a main throughway housing embassies and a major hotel. It is in this neighborhood, at a convention center, that Diendéré, the former head of the presidential guard, and former Foreign Minister Djibril Bassolé, as well as 82 others, are standing trial for their roles in a 2015 coup d’état that sought to overthrow the fledgling transitional government in favor of Compaoré’s allies. Former RSP soldiers, some wearing the uniforms of the regular army and some wearing civilian clothes, respond one by one to questioning by military judges and prosecution lawyers. Diendéré — who is locked in a maximum-security military prison and charged with treason, attacking state security, and the beating and murder of protesters — is due to stand for questioning soon. Few would have dreamed it was possible for someone so feared and powerful as Diendéré to face such serious criminal charges, making the trial an unprecedented push toward justice and accountability. Dozens of journalists attend the proceedings, passing through the tight security checkpoints to enter every morning and write full accounts of the day’s proceedings in almost all of the country’s newspapers. Prior to their political demise, Diendéré, Bassolé, and the Mauritanian consultant they worked with, Moustapha Limam Chafi, were key U.S. allies in Francophone West Africa. 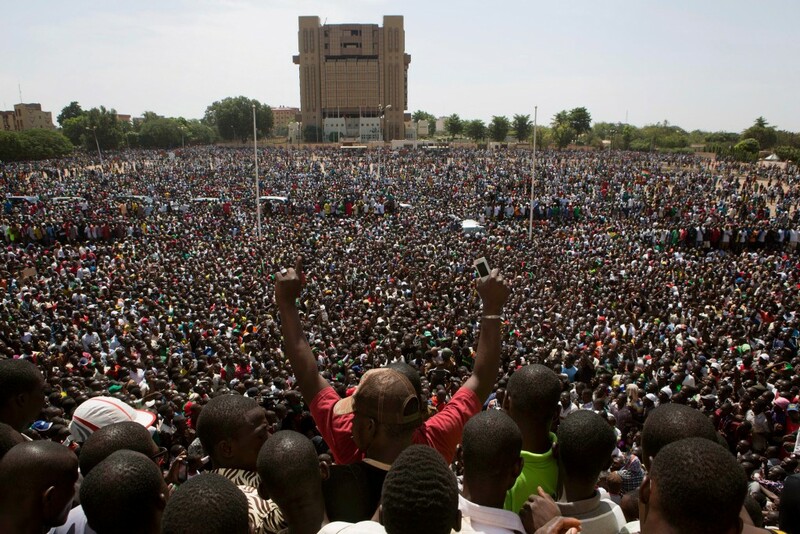 Burkina Faso, which means “Land of the Upright People,” had never experienced a terrorist attack. For instance, in 2012, Compaoré, then president, sent Diendéré on a mission north of Timbuktu, Mali, to procure the release of Swiss hostage Beatrice Stockly, who had been kidnapped just nine days earlier by Al Qaeda in the Islamic Maghreb. Over soft drinks and grilled lamb with one of the most wanted Al Qaeda leaders, Diendéré ensured the handover of millions of dollars in return for the Swiss missionary. Compaoré — who had come to power in a coup that killed the revolutionary leader Thomas Sankara in 1987, instilling stability through authoritarian rule — had played a key role in negotiating the release of multiple Western hostages in the region. There was a cost to this, however. Known as the pompier-pyromane (“firefighter-pyromaniac”), his efforts to negotiate peace deals with neighbors (like the talks between Tuareg rebels and the Malian government in Ouagadougou in 2012) were buffeted by reports that he had played a more nefarious role in numerous conflicts, including arming rebels in Ivory Coast and trading weapons for diamonds to former President Charles Taylor in Liberia. In 2014, a popular uprising of millions of protesters fed up with the pompier-pyromane took to the streets and chased him from power. Compaoré fled on a French helicopter to neighboring Ivory Coast and is still there. One of the transitional government’s most ambitious acts was to try to completely dissolve the RSP. But in 2015, before the transitional government got a chance to carry out its plan, Diendéré and the RSP staged a coup against the transitional government. Diendéré’s forces were defeated by the regular army and street protests. The RSP was completely dissolved immediately after the civilian government was restored to power. But this created a dangerous vacuum. “The intelligence system that we had was based on structures at the gendarmerie and at the presidential security unit,” said Traoré, the confidant of the ousted president. “Those structures were brutally broken up, and the man at the center of all that, Gen. Gilbert Diendéré, was taken out of play,” he added. The vice president of the parliament, Bénéwende Sankara, at his office at the new parliament building in Ouagadougou, Burkina Faso, on Aug. 28, 2018. Some in Burkina believe that the RSP and the former regime are at least partially the cause of the country’s growing instability. “There is a common interest between the terrorist groups that operate in West Africa and the Burkinabé political camp that is no longer in power,” said Guy Hervé Kam, co-founder of the Balai Citoyen, one of the main groups that organized protests against Compaoré, and one of the prosecution’s lawyers in the trial against Diendéré and his co-conspirators. The police commissioner, Anihifahata Yacoub Sié Rachid Palenfo, said that while RSP deserters may be participating in the attacks today, there is no proof of this, although he noted that a number of RSP dismissed for mutiny in 2011 had been proven to be committing crimes and attacks shortly after their dismissal. Burkina Faso’s former prime minister, Luc Adolphe Tiao, far right, waits for the opening of the trial of the former president and members of his last government on April 27, 2017 in Ouagadougou. A damning Human Rights Watch report stated that the Burkinabé military’s heavy-handed response to jihadi militants often aggravated the problems. According to the report, “Burkinabé security forces have conducted counterterrorism operations in 2017 and 2018 that resulted in numerous allegations of extrajudicial killings, abuse of suspects in custody, and arbitrary arrests,” and a significant portion of the abuses were against the Peul ethnic group. The security forces’ wanton violence has led to more lawlessness and local residents are less likely to cooperate with them against the jihadi groups, the report noted. Kam, however, told me that the prosecution has audio recordings of RSP and former regime members plotting in French and Arabic with Malian militants to attack the country. The attacks echo an audio recording released in 2015 purporting to show the president of neighboring Ivory Coast’s parliament, Guillaume Soro, floating a strategy to destabilize the Burkinabé armed forces in the wake of Diendéré’s failed coup of 2015. “You hit a city in the north; we take a police station or a gendarmerie. They’re going to flee, they can’t resist,” Soro says in a phone conversation with Djibril Bassolé, who replies “Yes, OK.” Soro is a former rebel who received arms from Compaoré and Diendéré when his New Forces soldiers were fighting then-Ivorian President Laurent Gbagbo, and is close to the former Burkinabé regime. A vendor sells fruits and vegetables at dusk in the Ouaga 2000 neighborhood where former Gen. Gilbert Diendéré and the coup plotters of 2015 are on trial in Ouagadougou on Aug. 28, 2018. The hope for a new kind of democracy that swept the nation after the dictator fell has given way to fear and apprehension. With Burkina Faso’s security falling apart, the U.S. response seems to be more of the same. The U.S. military is once again working with counterterrorism units in the country. “We are helping Burkina Faso build counterterrorism units to counter violent extremist organizations (VEOs) based out of Mali, and we assist terrorism response forces in Ouagadougou,” said U.S. Africa Command spokesperson Becky Farmer. Additional reporting by Nadoun Coulibaly and Claude Romba.